For those that have Microsoft EMET installed on their machines, they know that adding Microsoft EMET to individual programs can go a long way in strengthening the security of a program such as a web browser, a media player, Adobe Flash, etc. Unfortunately for us, Adobe changes the names of the main executable files that make up the Adobe Flash Plugin for Firefox/Mozilla browsers. Having to go into EMET’s configuration tool and update it every time Adobe pushes out a new version of Adobe Flash is a pain in the… you get the idea. 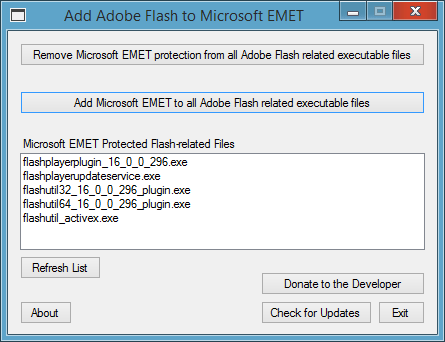 Introducing Add Adobe Flash to Microsoft EMET, another free program that I have put together to help in the fight against Adobe Flash exploits with the power of Microsoft EMET. First it scans the registry for obsolete Flash related executable files and removes the appropriate registry entries from your system. Then it scans for new Flash related executable files and adds the appropriate registry entries to add protection to it. All in one easy to use program. Starting with version 1.2 Build 1 Microsoft EMET 5.5 is supported. Microsoft drastically changed things with EMET 5.5 so major changes needed to be done to the program. Full source code is available here for peer review.